The Missouri Legislature’s vote to override Governor Jay Nixon’s (D) veto of a bill requiring a photo ID to vote was on party lines, with Republicans in favor and Democrats opposed. House Speaker Todd Richardson (R-Poplar Bluff) says it will bring integrity to the election process. “Representative (Justin) Alferman’s efforts on photo ID, which has been an important effort for this (House GOP) caucus and this majority to try to bring some integrity to our election process for a number of years,” Richardson told the Capitol Press Corps Wednesday evening. 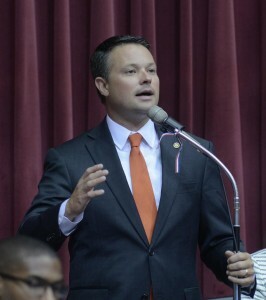 But House Minority Leader Jake Hummel (D-St. Louis) says the law will impact seniors and the disabled. “The right of the voter is not supposed to be infringed. Putting another layer of restrictions in front of the voting populace is the wrong thing to do,” Hummel told Capitol reporters. Hummel hopes the court will declare photo ID unconstitutional, if Missouri voters approve the measure in November. Wednesday’s floor debate was emotional, in both chambers.